Linda at Flipside has earned the seventh Atta Girl award. If you read her post from her holiday you will see she has kayaked after many, many years away from the sport. That would be enough but no, no, no. Linda did much more than that to earn this award. Linda ate and paid for the most awful meal just so she could use the restaurants WiFi connection to post on her blog. Now come on people. What could be more deserving than that? Way to go Linda. 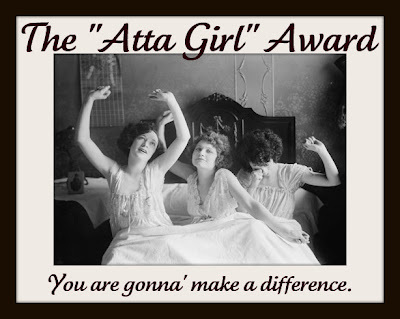 Now if you know someone who deserves this award just give it to them but please link back to me and also let me know who it is so I can add them to the list on my sidebar. Linda you can take the thumbnail picture from the sidebar to add to your blog. You deserve it but I really would like to know what you ate. Thanks for taking one for the team. Thanks for stopping by to visit today at Playing Dishes. You have been entered in the July 25 tablecloth giveaway. Next day we found the right steak restaurant, but it will have to wait until next summer. Thanks for the award, Lori. I will post it proudly on Flipside.